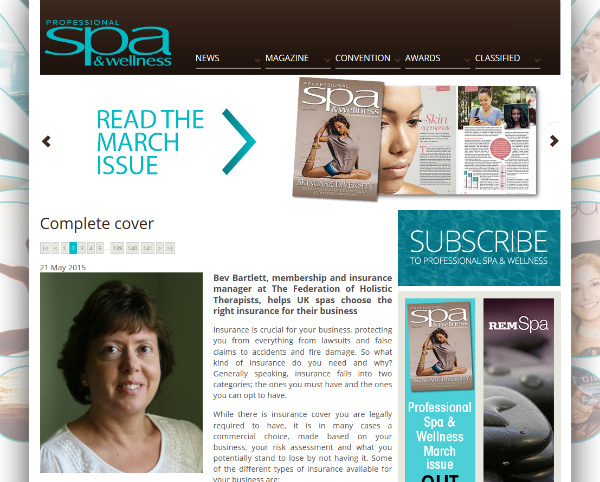 FHT’s membership and insurance manager, Bev Bartlett, helps UK spas choose the right insurance for their business in an article published on the Professional Spa & Wellness website. As well as explaining the benefits of employers’ liability and medical malpractice, the piece also looks at some lesser-known types of insurance cover, such as business interruption and employee dishonesty. Insurance is crucial for your business, protecting you from everything from lawsuits and false claims to accidents and fire damage. So what kind of insurance do you need and why? Generally speaking, insurance falls into two categories; the ones you must have and the ones you can opt to have. While there is insurance cover you are legally required to have, it is in many cases a commercial choice, made based on your business, your risk assessment and what you potentially stand to lose by not having it. Posted on 22 May, 2015 by Federation of Holistic Therapists (FHT). This entry was posted in business, news and tagged news. Bookmark the permalink.